Christmas bonuses are nice, but Christmas bonus baby monkeys are a much better story! WBIR reported on Tuesday that Zoo Knoxville, in Knoxville, Tennessee received its promised gift from Santa Ana Zoo in California of three new Silver-Lead Langur monkeys for its Asian Trek exhibit last week. 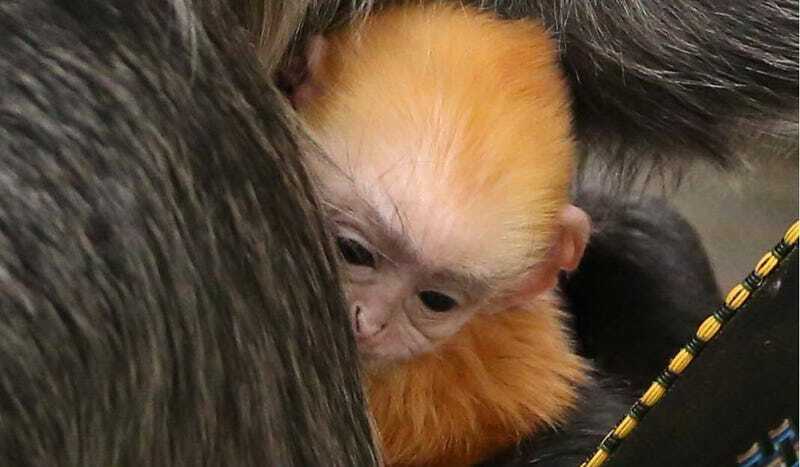 Then, on Christmas, some of the zoo’s employees noticed a small, orange object protruding from one of those gift monkeys, which turned out to be a baby monkey, clinging to its mother. Which inspiring, anthropomorphic creature will be the Fiona of 2018? Perhaps this clingy monkey youngster will be in the running?